As Eric & I arrived at my Mom's on Christmas Eve, the kids all tumbled to the door with smiles and excitement left over from the Christmas Eve Eve sleepover. Laura immediately thrust her ipod towards me and sung look-look-look at Ishanga. I had to unravel myself from my Mom's arms, and set down our bag of gifts under the tree... because I wanted to be fully present for her. She showed me again... and I cooed and maybe got just-a-little-teary. Ishanga? Did you name her? No, I just chose her... because of Shanga. Ishanga is an elephant, Laura's foster elephant. She lives in Kenya at the David Sheldrick Wildlife Trust... "a haven for elephant orphans." She was saved from the jaws of a lion, nursed back to health, and one day... she will return to the wild. The whole time Laura was sharing Ishanga with me, Cam was at my side practically bouncing out of his skin waiting to share his elephant with me. He had already shouted out his name... Kibo! And that name brought its own tears, too. I didn't even wonder why he chose an elephant named Kibo, I knew, and I loved. And I thought it amazing, perhaps a wave of His most beautiful hand, that there would be two elephants at the Trust that would have such connections to our own trip to Africa. Kibo was the name of the safari company that we rode with for two of the most wonderful weeks of our life. But it was finally his turn... and we went to the computer and he brought up Kibo's picture. And how could I not tumble into love? Kibo was saved after he fell into a well... his ears so sunburned. 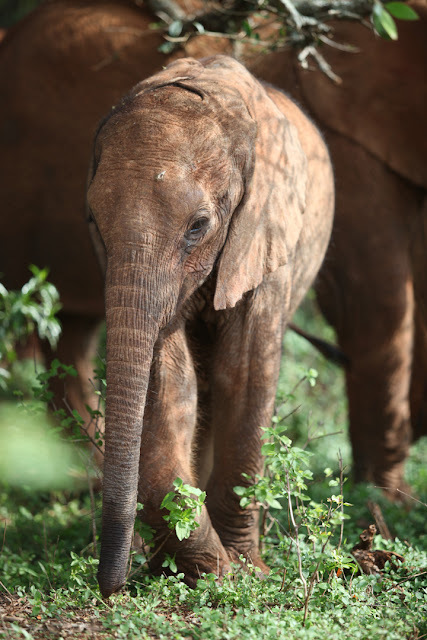 And at only two or three weeks old Kibo was flown to Nairobi in a rescue plane and now lives at the Trust... safe and strong, and someday, free. Laura and Camden love these biggest gifts, and these big-little elephants have somehow become part of our life across a million miles. Their hearts grew that day... the hearts that had already been stretched beyond their imaginations to fit Africa were pulled just a bit more... to embrace baby elephants. And I love that my Mom continues to share her dream, her heart for Africa. What a gift to give! One so big, and so full of life... one they will hold dear to their own heart. 'Saving wildlife and wilderness is the responsibility of all thinking people. for its existence is essential to the human spirit and the well-being of the earth as a whole. 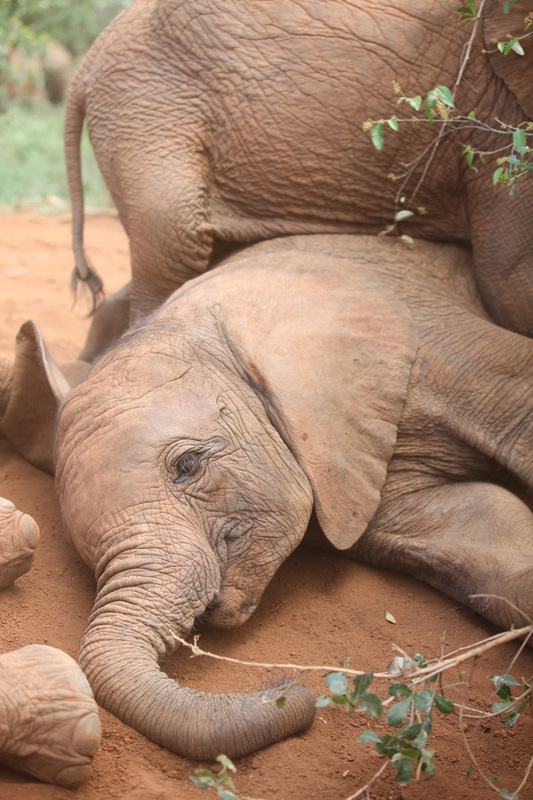 Do you want to find out a little more about the David Sheldrick Wildlife Trust? You can follow them on Facebook and you can foster your own elephant or rhino! And do you remember when we had our dug deep into a bucket of popcorn? We were watching the preview for Born to Be Wild... I know just what I'll be doing on April 8th, 2011! ... linking up to Amanda at Serenity Now for weekend bloggy reading! Dawn, you are one blessed woman. To have your mom. And to have your kids. Three generations of wonderfulness! Oh, how very, very wonderful. I love the pictures. I love their passion : ) The children and the wildlife trust : ) and I LOVE the pictures of the beautiful elephants. Off to friend them right this second! This is such a beautiful gift for your kids; for all of us. Oh that is one big present under the tree! I would LOVE to sponsor an elephant! Kiddo would flip backwards if we were able to do that. It's not possible right now, but maybe in the next few years. How wonderfully exciting!! WOW!! that sure is a gift that keeps on g r o w i n g! !